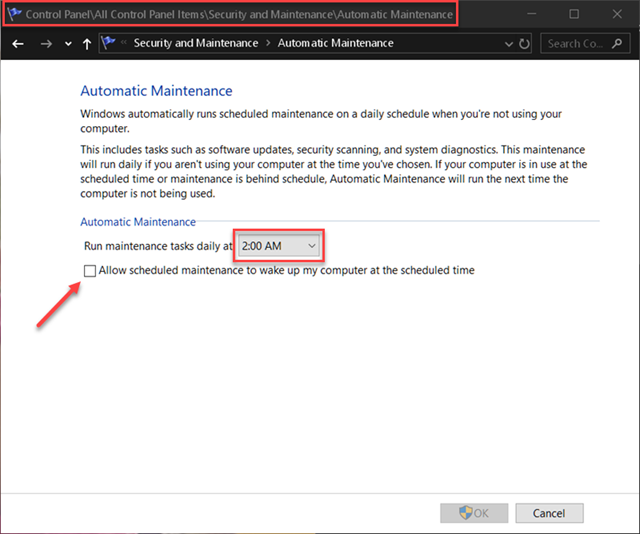 Windows 10 tries to keep your PC running smoothly by running certain maintenance tasks on a schedule. This includes such things as keeping Apps up-to-date, running virus/malware scans and updating Windows, too, if needed. Windows tries to run these tasks when they will impact the user the least and is set by default to run at 3 AM. To keep this schedule, Windows will sometimes wake up a sleeping computer to accomplish this. I don’t ever want my computer wrested from its slumber, and some of you might like the schedule to be changed from something other than 3 AM. In this week’s Quick Tips article, we’ll show you how to make these simple changes. What is, “Out Of Date” ….. probably the short, sharp comment! Oh the joy of free speech (expressing oneself even in posting). Debated with myself overnight since I am 99.9% sure that individual has no clue about the rules of posting. That using CAPS set to ON, is considered shouting out loud. I serious doubt he will reply (might be too embarrassed). Pity as I too wanted him to explain his statement. The only pleasure in posting my comment is maybe someone else will read, and learn from James Robinson ordeal, Mindblower! Now, now, we mustn’t presume that our friend James was intentionally being a jerk. Maybe he didn’t know that ALL CAPS was considered to be yelling in the forum-way of things. We must be patient with new-comers, mustn’t we? All reasonable comments are welcome, even if they aren’t particularly helpful. I tried the article steps to set up AUTOMATIC MAINTENANCE on my Win10Home system. Is this procedure correct for Win10? 1. The Control Panel can be found by clicking the Start button, then typing “control panel”. It should be at the top of the list. That should send you on your way. Note: I cannot vouch for this working in Windows 10 Home. This was tested on the Windows 10 Pro version.